Can a Felon Become a Canadian Citizen? As those who have been convicted of a felony realize, life as they knew it prior to the conviction is over. That doesn’t mean that life is over; just that nothing will ever be the same again. Some felons believe that no matter what they do, their felony conviction will prevent them from getting a job but also succeeding in the United States. This may lead them to decide to move to another country. 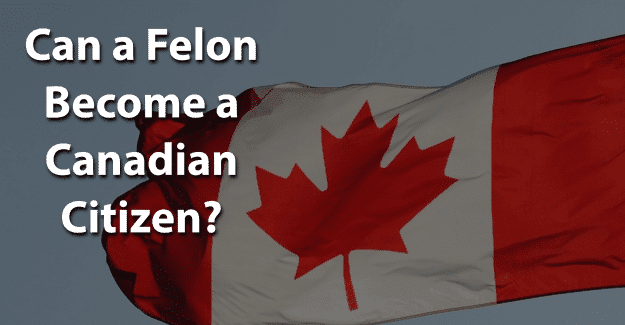 This blog post will address the question of whether or not a felon can become a Canadian citizen. Each country has guidelines for allowing visitors to enter and remain in their country. These rules are laid down with different criteria according to each nation. Many countries don’t require a visa application in advance for those staying less than 60 or 90 days. For those wanting to live in a country, a residency application is typically necessary in addition to a valid passport. In order to be employed in their new country, all persons must obtain a work permit. The regulations for these vary and can be checked on at Canada’s consulate in the U.S. prior to moving. Contacting an immigration attorney before moving is essential. Permanent residents are not citizens of that country and can be expelled for a serious criminal conviction there or failure to pay U.S. taxes on their job in the providing country. To become a permanent resident in Canada, someone can apply through the province of choice and confirm plans to remain in Canada. Permanent residence is defined as living in Canada for least two years in a five-year period. Canada excludes anyone convicted of any offense for at least five years following the conviction. Then, they must be certified by the Canadian Minister of Immigration as rehabilitated. Someone cannot become a Canadian citizen if he or she has recently been in prison, on parole, or probation, and is serving a conditional sentence or has been convicted of a crime. Anyone who has committed a non-summary offense and applied for citizenship after a five-year period must also demonstrate that he or she is rehabilitated. A summary offense is one that is considered less serious than other types of offenses. It’s indicated by a shorter prison sentence and smaller fine. The maximum penalty for a summary conviction is a sentence of six months in prison and a $5000 fine. Criminal Rehabilitation (CR) is a process by which a felon is determined to no longer be a legal risk according to the Canadian government. This applies to those who have been convicted of at least one serious felony which is a felony in which the maximum sentence would have been at least ten years in Canada. Typically, according to Canadian law, offenses considered serious are those involving bodily injury or a weapon. It’s only available to felons who have finished their sentence, including probation and paying all fines, at least ten years previously. It typically takes a year to attain this status. An individual who has only one non-serious felony, an offense which would receive less than a ten year sentence under Canadian law, is deemed “rehabilitated” if more than ten years have passed since the completion of their sentence. Felons who can prove they’ve been rehabilitated either because of a deferral or conditional discharge or because the felony has been expunged or pardoned do not have to apply for Criminal Rehabilitation. Criminal Rehabilitation will permanently remove the inadmissible status from felons’ records. Application for CR is a complex process. Retaining an attorney is highly recommended to assist in completing this process. A National FBI certificate as a sign of an FBI record check is also necessary. The reason is to make the Canadian government aware of every crime, even misdemeanors, committed by felons. It’s important to be honest while filling out an application to apply for a temporary resident status in Canada. If a felony isn’t disclosed but is found on a background check, this constitutes fraud and is punishable. It’s a crime to falsify an application, which could result in being sent back to prison. In order to be successful in becoming a Canadian citizen, it’s essential for felons to be honest about their background. They are already seen with negative perceptions of being dishonest, untrustworthy, and unwilling or unable to follow directions from authority figures. Having their record expunged can give them the chance needed to begin with a clean record and succeed in becoming a Canadian citizen. Expunging a criminal record allows anyone to honestly state on an application that he or she has not been convicted of a crime. It’s a big challenge, but it might be worth it for a felon wanting to become a Canadian citizen. Having his or her record expunged and also documenting any training programs or additional education could make the essential difference in demonstrating good moral character. Having support from family, friends, or previous employers can make a huge difference. A felon doesn’t have to be defined by his or her crime. We are defined by how we recover from our mistakes and not from the mistakes themselves. He or she can begin again and live an honest life no matter how difficult it might seem. What do you think about this blog post? Have you or someone you know been in the situation of trying to become a Canadian citizen with a felony? What was that like for him or her, and how did he or she achieve success? Please tell us in the comments below.